Today, we’re going to take a deep-dive look at your VA Onboarding Process. 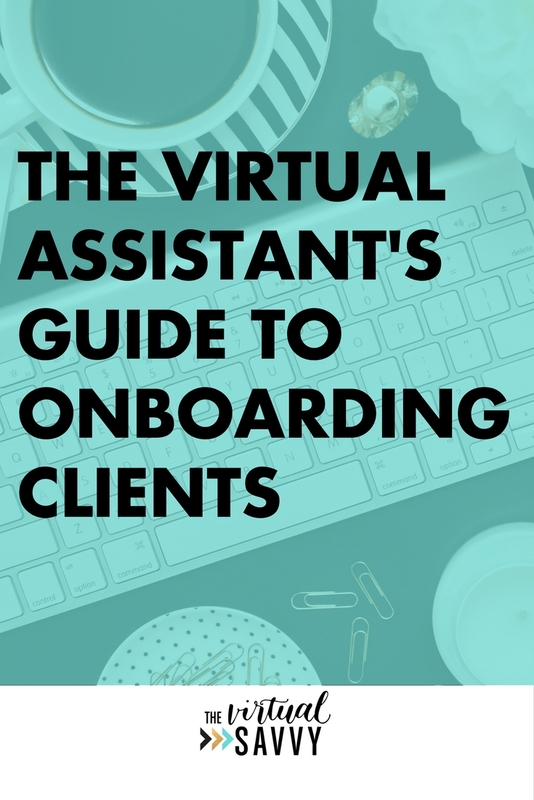 An onboarding process is the steps that you take after a new virtual assistant client is signed. How will you get projects from them? How will the two of you get to know one another? That’s what we’ll be talking about today. Close your eyes and imagine with me for a minute (I’m not sure how you’ll close your eyes and continue to read this, but just go with it…). This could be the start of everything – the big break you need to finally get your business off the ground. All you need is this one client to take your business from the dreaming/planning stage to the “This is for real!” stage. You have relentlessly researched your client and their industry, making sure every minute detail is discovered. You have the picture-perfect, authentic branding, showcased in a beautiful and put-together portfolio. Maybe you even have a website perfectly tailored to your ideal client. When the email comes back telling you that the client is interested, you can hardly believe your eyes. There are signs of life emanating from the other side of the screen. The joy, elation, and ALL THE HEART EYES last for a short while but are quickly replaced by eyes that look like a deer in the headlights…. 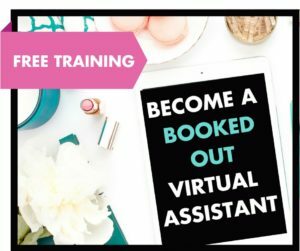 When I landed my first client, I had JUST started working as a virtual assistant. To tell you the truth, I really had no idea what I was doing. I didn’t have a contract in place. I didn’t know the questions to ask them. We just started working and decided to “figure it out along the way”. Let’s avoid that. I guarantee you and your client will both appreciate having a smooth onboarding process as you begin your work together! Take a look at this step-by-step guide to onboarding that will lead you through the very first interest in your services, all the way to signing the client as your very own. Once a potential client has shown interest in your services, it’s important to schedule a meeting with them. Ditch just emailing back and forth. Phone is good, face-to-face (like using Skype, Google Hangouts, orZoom) is best. Your clients need to SEE you. They need to see and interact with the person that is going to be handling a part of their business. I recommend setting up your meeting using an online scheduling tool like Calendly or Acuity Scheduling. These tools make scheduling calls a breeze! You’ll just send over a link to your potential client to your calendar that contains a list of available appointments. They will then choose a date/time that works well for them. Important: Make sure you keep your calendar updated when you add events elsewhere. You’ll want to make sure that your availability is always up to date, so you aren’t having to reschedule calls. Follow up with the client to confirm the date/time of the appointment – most schedulers do this automatically, but a personal follow-through is a nice touch. In the hour leading up to the call, review the notes you have taken previously on the client’s business. Look back through their website. Glance through their social media posts. Take notes of new content on their blog. Write down questions that you can ask as you review their content. This is where you want to get the feel for their business and help them envision your transition into the VA role on their team. You’ll want to prepare a list of questions to ask during the discovery call. It’s GOOD to ask questions. Get them talking about their business. People love to talk about their business and they will love that you are genuinely interested in it. What are your expectations for a VA? Do you prefer email or another way of communication? How often do you want to touch base via video conference? Remember, discovery calls are for YOU to discover if this client is a right fit for YOU and not the other way around! These questions will help you see the heart behind the business, what their working style is, and how much they have really prepared to have a virtual assistant join their team. When the call is complete and you feel confident that you and your client will make a FANTASTIC team, send follow up notes of the call (recap the conversation and any needed action items). Even if the client didn’t agree to become your client during the call, it is good to go ahead and send them your contract. Assume they are taking the next steps with you and make that process as easy as possible. This email is also a great place to ask any last minute questions that you may have forgotten to cover during the interview as well. I recommend doing this along with your follow up email, but you can use your judgment, based off of the conversation that you had. Let me stop and say that it is VITAL that you have a contract in place. Attorney Danielle Liss states that if there is ONE thing you do to protect yourself as a business owner, it’s to have a contract in place. Click here to watch a full interview with Attorney Danielle Liss on getting your VA biz legal. I recommend using a contract signing software like Hellosign or Docusign to have your contract signed. This is an easy way to have your contract signed without having the new client have to print, sign, scan, and email you back the contract. Once your contract is received, make sure that you keep a copy in a special folder on your computer. I would recommend even printing out a physical copy. Your contract is important to keep on hand and to reference as needed. If you don’t have a contract for your virtual assistant business, you’ll want to get one, pronto. Check out the VA Toolbox offered here at The Virtual Savvy. You’ll get complete access to a new client contract, a subcontracting agreement, and a portfolio template. It’s all of the contracts and documents you need to successfully onboard your next virtual assistant client! It’s my recommendation to receive some kind of payment before you begin working. That could be partial payment, a deposit, or full payment. When it comes time to send an invoice (based off of your specific contract terms) there’s a few tools you can use to make the process seamless. If you are just starting out, I recommend Wave Apps. Wave is an invoicing system that is totally free. You can even send out recurring invoices and reminders. Once you have the signed contract back and the invoice is paid for your very first package, now it is time to set up your onboarding meeting with your new client. This meeting is a one time meeting, usually lasting about 45 minutes, where you will go over all of the specifics of your working relationship with your new client. During this meeting, you will discuss your working hours and procedures, set up how you will get work from your client, get the documents and passwords that you need to do your job successfully, and more. Want to use our signature system for onboarding your new client? Check it out HERE. If your client is unwilling to meet with you every week, I recommend sending them an email every Sunday or Monday that will list out the tasks that you’ll be working on for them over the week. Don’t be scared to over-communicate. It’s not a comforting feeling as a client to dish over money to an almost stranger, and then never receive any updates or reports on how the projects are being handled. Be proactive and communicate regularly with your client about your current projects. As you begin signing new clients, you’ll want to have a seamless process for getting to know them and communicating the way that you will work together. Remember, you are the boss. They are hiring you as a specialist, so it’s ok to communicate how you work with your client. Their paying you to be the expert, so act like it! Much of that comes with being confident in your processes. When you have a step-by-step onboarding process in place, you’ll be able to portray confidence as you start your working relationship together. Want to get super-organized in your onboarding? We’ve created a special Onboarding Trello Board and Training just for you! What does your onboarding process look like? Share in the comments below! This couldn’t have come at a better time…..I just scheduled my very first discovery call for this coming Monday!!! (ps – after just getting my new Savvy Site website up last weekend :-)). Thank you so much for all this amazing information and guidance. Congrats! You are welcome and I can’t wait to see how well things go for you. WOW!!! This is so much value!! Great job! Thank you, Naomi! I am happy to hear you’re receiving value from my posts. I am just starting and I have my first “official” client. I had originally traded some hours of work in exchange for testimonials, but now she would like to continue! I am working to set up all the pieces of my workflow. Your website and emails have been a big help! I am using the steps here, and piecing together the contracts, invoices and welcome emails. Nerve-wracking! You’ve got this girl! Congrats on your first official client! I hope this helps. This is excellent. I really need to get my finger out. I am doing VA work with one client but it is no where near as formal as it should be. I’ll get to it. Thank you. Am looking forward to the session this afternoon. In the recent past, your counsel has been invaluable – to say the least! I read this yesterday, as I scheduled for a new client interview today. I used your advice, especially the part about getting to know the client and I am looking forward to working with this particular client. If not, I am happy I learnt something new, and went ahead to use it!! Thanks a million girl! That is awesome Evah! I am so glad that it was helpful! How did the call go?! Gosh Abbey, this is awesome! Such detailed info! Thank you! This post made me literally LOL multiple times! Not only that, it’s FULL of helpful info! You rock! You are amazing!!! This was extremely helpful. Thank you! Thank you so much for this post! I’m just starting out in VA work and this is so helpful!